These systems are located outside, usually on a rooftop platform but also at ground level. They contain one or more compressors, evaporator fan & coil set & condenser fan & coil set. Used in situations where the outdoor package unit can be located close to the air-conditioned space, the cool air is delivered by insulated ductwork. A high percentage of air is returned by a separate duct system from the air-conditioned space to the unit via a bank of filters. 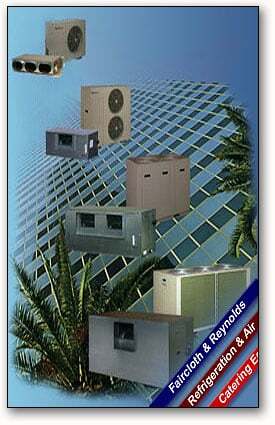 A small percentage of fresh air is also introduced at the point of air return. Zone control can be achieved most economically by installing a number of independent package units, thereby also reducing the point load of equipment on roof structures. Alternatively, electric duct heaters or variable air volume devices may be used.